R.S. 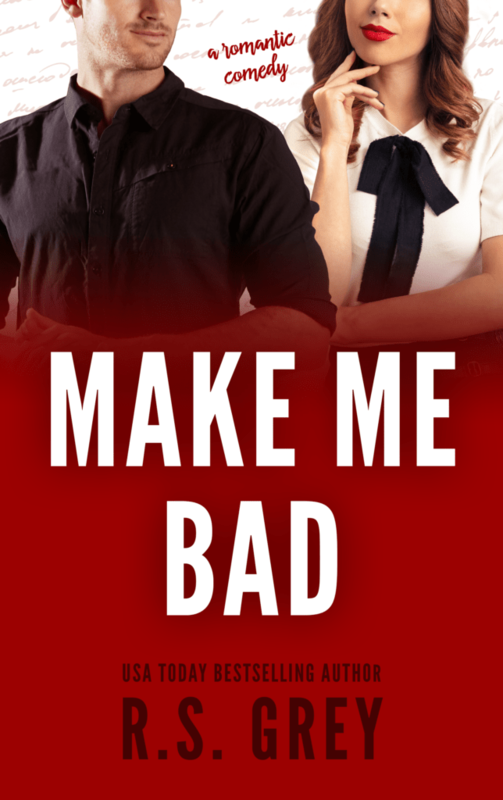 Grey’s newest romantic comedy, MAKE ME BAD, is available now! Boy did this book come into my life right when I needed. There’s just something about the way R.S. 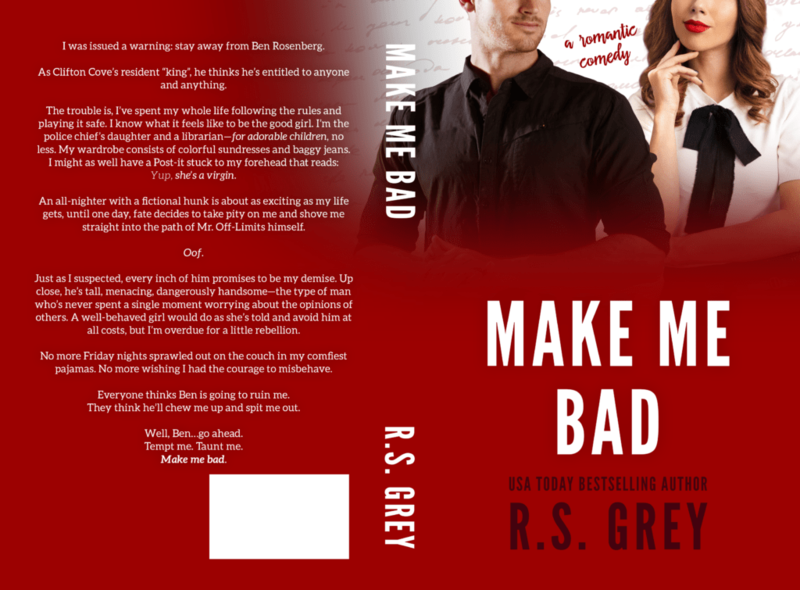 Grey crafts her romantic, feel good comedies that puts a smile on my face and a song in my heart…well probably not the song part but I’m definitely riding a book high when I finish reading her low angst, adorable reads, and Make Me Bad follows suit, and I might even say it’s one of my absolute favorites of R.S. Grey’s stories! I can’t tell you how much of Madison’s life was the mirror image of my life at that age. Even though I wasn’t still living at home, I was still the good girl, the rule follower, the girl who didn’t take a lot of risks for fear that my escapades would get back to my father or the school district I taught at because when you live in a small community, everyone seems to know everyone else’s business, and due to Madison’s father’s job as police chief of Clifton Cove, Texas, she can’t do anything or go anywhere without her dad knowing, so I really can’t blame her for being in bed with a good book at 8:00 each night! Ben Rosenberg’s lifestyle is pretty much the antithesis of Madison’s. Growing up privileged, he had the best of everything and the attitude that goes with living in luxury. Add to that the fact that his past shows that he liked to live it up a bit more than he should have and it’s beyond clear that these two would not ordinarily run in the same circles, which must mean that fate had a say in bringing this shy librarian and well-bred lawyer together. The fact that Madison’s dad has a history with a younger version of Ben works well with Madison’s desire to branch a bit more than she would ordinarily do, especially after her father forbids her from associating with bad boy Ben, so just going against his wishes is something Madison wouldn’t normally do, but the chemistry between her and Ben as well as their attraction to each other resonates from the pages, so I can’t say that I blame Madison for choosing to live dangerously and go behind her dad’s back by striking up a friendship and maybe even more with one of his enemies. I love that Madison didn’t completely go off the rails when it came to her misbehavior; she’s been a rule follower for so long as well as a daughter and a sister who almost always listened to her father and her brother’s dictates that becoming unhinged wouldn’t have realistically illustrated her desire to be bad, so the fact that Madison works on spreading her wings, breaking away from her father’s influence, and taking the necessary steps to become her own woman was the perfect path for her, and the fact that Ben allowed her to do that and guide her when she needed a tutorial or two in how to take a walk on the wild side. I absolutely adored Madison and Ben’s story. It’s funny, romantic, and entertaining with the perfect amount of sexual tension and steam. Readers will be smitten by Madison’s quirky personality and the things Ben does to show her how he sees her and how she should see herself. Make Me Bad checked off EVERY SINGLE ONE of my romantic comedy boxes and then some. It’s such a fantastic read, and it made me feel so damn ooey gooey inside when I was finished reading!